Most wouldn’t expect a 40-year old to compete at a collegiate wrestling tournament, facing young wrestlers in the prime of their careers. 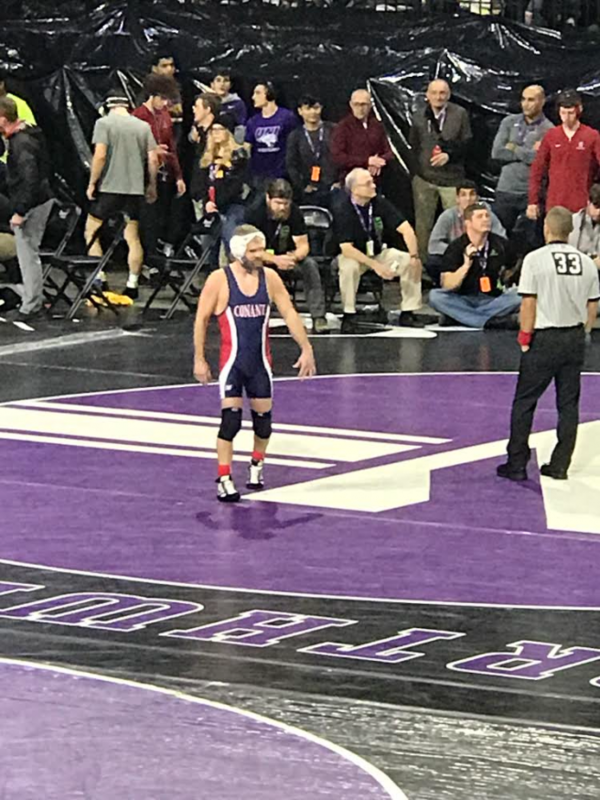 However, on Dec. 29 at the Ken Kraft Midlands Championships at the Sears Centre in Hoffman Estates, Conant math teacher and head wrestling coach Chad Hay did just that. This was not Hay’s first time competing in the Midlands Championships. “Midlands is kind of like the biggest collegiate tournament besides the national tournament. I wrestled at [the] University of Illinois. I wrestled in it four times when I was college,” Hay said, who added that anyone who wrestled in the tournament before can petition to wrestle in the tournament again after college. Hay last competed in the tournament in 2005, four years after he last competed in college. On Dec. 29, head wrestling coach Chad Hay competed in the Ken Kraft Midlands Championships at the Sears Centre in Hoffman Estates. At age 40, Hay was the tournament’s oldest participant. When Hay decided to petition and compete in the tournament again, Conant Athletic Director and Midlands Championships Administrator John Kane said he thought Hay had lost it. “He’s 40-years old, so he hadn’t wrestled in quite a while. 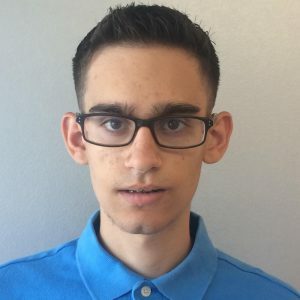 But I also knew he was pretty excited about it, and I know when he says he’s going to do something, that means he’s going to do it,” Kane said. Hay began training for the tournament in April when he started lifting for the first time in 15 years. Assistant wrestling coach Jim Harder put together a training program for Hay that changed every six weeks. After starting with a pure strength perspective by lifting weights, which Harder said was for Hay to get stronger, Hay then moved into applying that strength for wrestling by lifting unbalanced water bags, pushing sleds, and various other exercises. During this time, Hay also started cutting down his weight. Hay wrestled in the tournament in the 141-lb. class but started his training at 172 pounds. “I got myself back as strong as I could get, and then cut down,” Hay said. When this school year started, Hay started to wrestle again. Hay practiced with current University of Wisconsin-La Crosse wrestler Danny Madonia, ‘16, as well as current Conant wrestlers Nicky Amato, ‘19, Alex Giuliano, ‘19, Filippo DeFrenza, ‘19, and others. After eight months of training, the tournament finally came. An old feeling had come back to Hay when he arrived at the Sears Centre the day of the tournament. “You get the all the feelings from a long time ago come back. You know, making weight. Just looking around and being the oldest guy in the competition was kind of funny,” Hay said. Hay’s warm-up partner from college, Twam Pham, was his warm-up partner for this tournament. “That was totally surreal,” Hay said. For this tournament, Hay’s coaches were his dad and brother. Other people supporting Hay were 30 Conant wrestlers working the tournament, his wife and daughters, his mom, friends from his hometown, and Kane. Head wrestling coach Chad Hay wrestles against The University of Iowa’s Carter Happel. Hay’s first match was against The University of Iowa’s Carter Happel. “I knew the guy that I was going to have for my first match was a four-time Iowa state champ and he placed sixth at Midlands the year before, so I knew he was going to be very tough, solid opponent,” Hay said, who explained that the University of Iowa’s style of wrestling is known for their pace. During the first four minutes of the match, Hay felt pretty good but then started to struggle with the pace, which led him to lose 16-4. Even with the loss, Hay competed in another match against The University of Buffalo’s Kyle Todrank. Hay lost that match 14-3, ending his time competing in the tournament. “I knew going in that my recovery time isn’t as great, but you always go in with the expectation you want to win. Your goals obviously change throughout the match. I go from wanting to win the match, to let’s get a takedown in the match, to let’s keep it presentable,” Hay said. Head wrestling coach Chad Way (right) wrestlers against The University of Buffalo’s Kyle Todrank. “I was impressed with how long [Hay] held in there in his match, how he wrestled. To really be able to battle against a kid in college that’s probably 19, 20, 21, I was really impressed. He was pretty lean and mean. He was ready for that match,” Kane said. If Hay wresltles in the tournament in 2020 or beyond, he would become the first wrestler to wrestle in the tournament in four consecutive decades. Unsurprisingly, Hay is planning on doing just that. “I feel like I got a good base now, lifting for that long after not having done that in a long time. I feel like my base shape is good, so I can always add on that. Over the next couple of years, I would like to keep getting stronger and improve in that way and then we’ll see if we do it again,” Hay said. If Hay does compete in the tournament again, he will aim to be placed in the 133-lb. class, where he wrestled in college for his last two seasons. For now, Hay will be leading his team into the most important part of the season, as Regionals are on Feb. 2 at South Elgin. Previous story The Crier Inquires: How bad must the weather be to cancel school?